The MagneStir is a full-featured magnetic stirrer that is ideal for laboratory applications where variable stirring speeds are necessary. Its stepless speed control delivers 50-1250 rotations per minute. Because it can be powered by 110VAC with a wall adapter, or by using 4 C-Batteries (not included) it is at home in the lab or in the field. When batteries are used, the AC operation is automatically bypassed. You can expect at least 50 hours of continuous operation under battery power. At the back of the base, there is a threaded fitting that allows the use of a rod assembly (included) that will accept a standard laboratory clamp, burette clamp or other fittings. The white stir plate makes it very easy to see color changes in endpoint titrations and other laboratory procedures. Combine it with ASI's Electrode Arm and Univerasal Microstirrer for 12mm electrodes for a high performance laboratory setup. 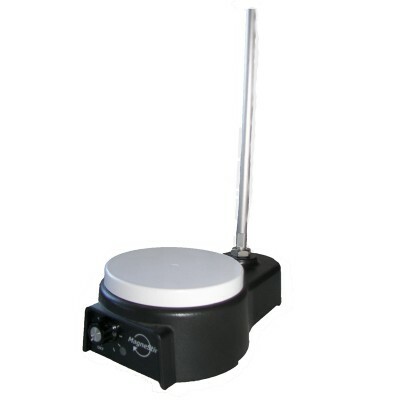 More features than other magnetic stirresrs at this pricepoint.